CORONAS (Complex ORbital Observations Near-Earth of Activity of the Sun) is a Russian program for study of the Sun and solar-terrestrial connections physics by series of spacecraft, which provides launching of three solar-oriented satellites onto the near-Earth orbit. CORONAS-PHOTON (or Koronas-Foton) is the third satellite in this series. Two previous missions of the project are CORONAS-I (launched on 2 March 1994) and CORONAS-F (launched on 31 July 2001). Launching date of CORONAS-PHOTON spacecraft is 2009. CORONAS-PHOTON is a part of International Living With a Star Program (ILWS). The main goal of the project is the investigation of energy accumulation and its transformation into energy of accelerated particles processes during solar flares; the study of the acceleration mechanisms, propagation and interaction of fast particles in the solar atmosphere; the study of the solar activity correlation with physical-chemical processes in the Earth upper atmosphere. Study of X-ray radiation from the bright local sources along Ecliptic plane. 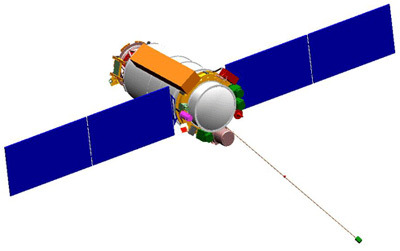 The powersystem of Koronas-Foton failed in mid January 2010, ending the mission after only one year in orbit.